DENMAC is presented with many opportunities to collaborate with well-known artists to turn their vision and concepts of Urban and Public Art into spectacular reality. 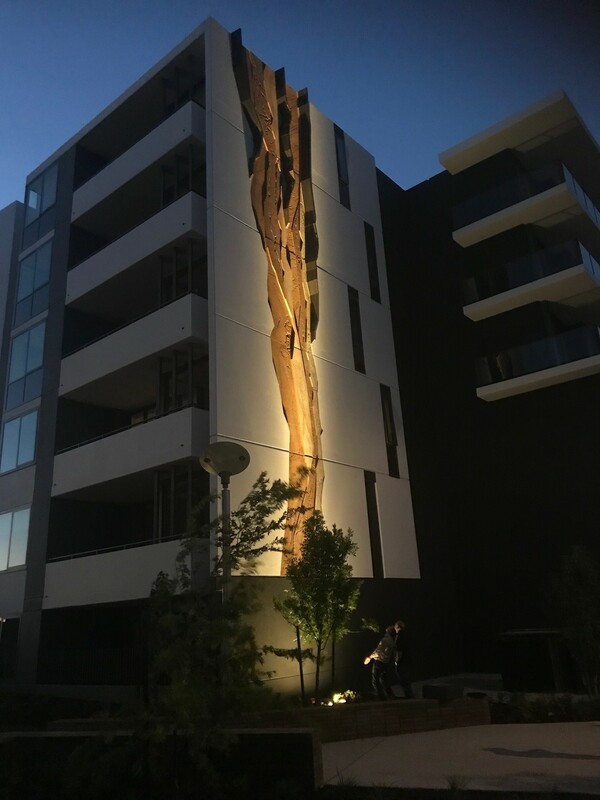 DENMAC help with design, fabrication and installation of stunning artworks around Perth, and one of our wonderful long-term relationships is with one of Australia’s premier and innovative artists, Lorenna Grant. Lorenna Grant discovered art at a very young age while constantly moving around and alone, giving her the opportunity to express herself and be heard. She found an aptitude in 3D modelling and drawing, which manifested as she got older and she started weaving as well as working with leather, clay as well as writing poetry. “I would take myself to night classes… back then they would only have a ceramic bowl class but I would make little sculptures out of the clay, always going off in my own direction” she says. While in school, Lorenna was barraged with the images and stories of artists and their tragic lives and there was no indication that anyone could “do art” full time. While she was selected for exhibitions at the end of high school, she wasn’t bolstered by that kind of achievement and left high school to spend the next 12 years travelling and living a self-proclaimed “wild” life. Lorenna describes art as “choosing” her, and it was something she didn’t properly start studying until 30 years old. After 3 years of art school, Lorenna knew it was her life and settled into a community of artists living in the Perth hills, showcasing her work in group and solo exhibitions. Lorenna describes her time exhibiting in a gallery as an amazing sort of “apprenticeship” as it taught her about scale and proportion, and the way art can affect the viewer and inform us about ourselves. 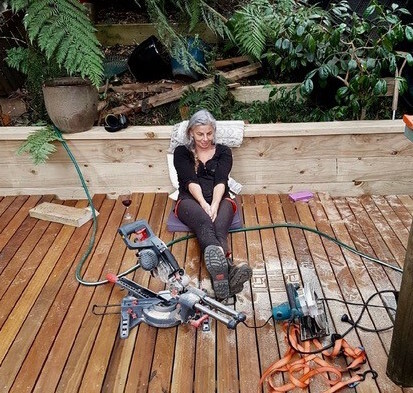 After several years, Lorenna was invited to teach art, design, visual literacy, sculpture and drawing at the local TAFE, and she also lectured at Edith Cowan University and tutored landscape architecture at the University of Western Australia. Lorenna enjoyed watching the students and describes their transition from self-conscious, unsure and doubtful students into confident adults as an exciting thing to watch, and she loved seeing them contribute to the collective artist community. However, weighed down from the bureaucracy and structure of teaching, it was one night in 1998 that Lorenna had an awakening moment, which she describes as a “compass” directing her onto another path. This moment pushed her to leave her teaching job, and within 6 weeks she was awarded two artist residencies, one for the National Australia Council in Milan and another 6-month residency in Barcelona and Switzerland. 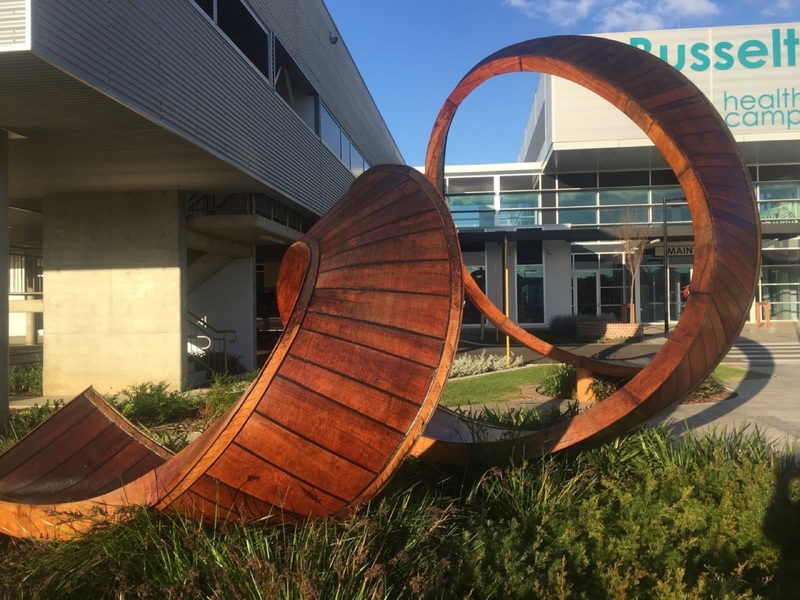 Within 6 months she had won her first public art commission from the Department of Education – which was also her first project with DENMAC, for Halls Head Middle School, called ‘Flying South’. While public art wasn’t the direction Lorenna was planning to go down, she was fascinated with figurative, classical sculptures and this morphed into ephemeral and landscape work. Lorenna found it a natural progression to move into public works and integration with buildings, and she uses the space around the proposed art location to inspire her. 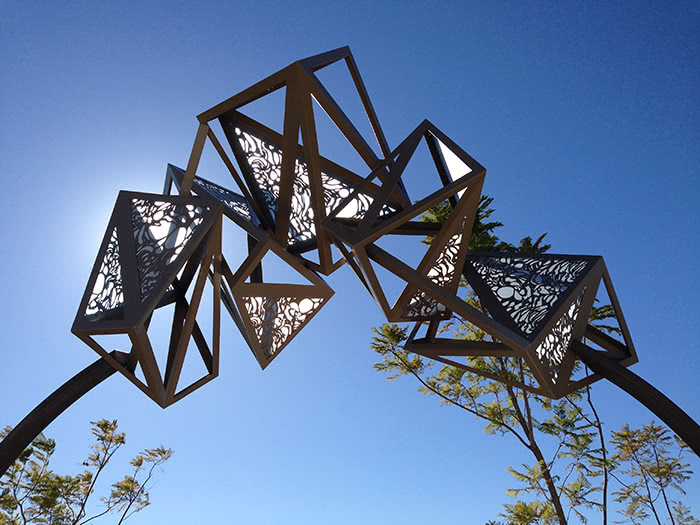 Mulla Mulla in Karratha (2012) – Made of steel, steel mesh, airbrushed enamels and light, this piece is a feminine show in a predominantly masculine townscape inspired by the floral ephemera found resilient amongst the iron hills of Karratha. 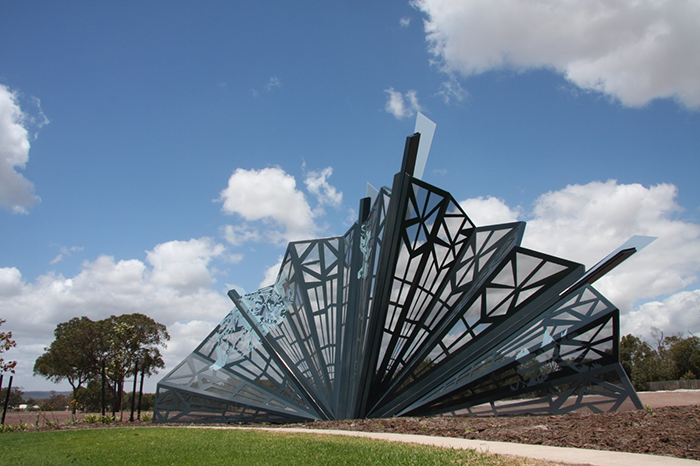 Beatty Park Aquatic Centre (2015) – Steel, paint, mirror stainless steel and light, this is inspired by the ‘rivulets’ found throughout the Beatty Park complex. 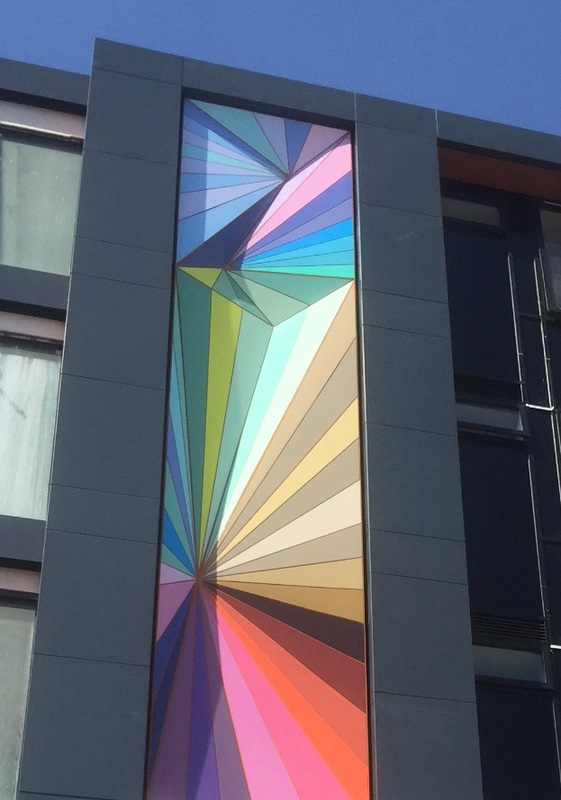 Artwork in Angove Street (2016) – Made from steel and composite panels, the inspiration was to show abstractly the presence of the ancestral community of North Perth, blending with references to the old movie theatre adjacent, echoes of the movie viewers and the classic red velvet curtains. Tales of a watchful older generation mixed in the present. Lorenna gives absolute dedication to each project, and unless she feels a “rising” and “connection” with a project, she will not agree to go ahead. She is also passionate towards the ecological and environmental impact that projects have on the surrounding location. Lorenna describes her influences as movement, energy, the unseen forces, watching things come and go and how they linger around us, the planets, stars and the earth. Lorenna defines a fatal flaw in projects is when the artist is being constantly directed, squeezing the magic out of the artwork. Working together with DENMAC for over 20 years, all staff including management, fabricators and installers have forged a strong working relationship with Lorenna. Their first project together was “Flying South” in Halls Head back in 1998. Made out of steel mesh, this project was based on bird migration from Siberia. Since then, DENMAC and Lorenna have worked on over 40 projects together (with a few more in the pipeline). The relationship between the artist and DENMAC team is one full of trust, understanding and fun, which makes every project flow with ease from initial design, all the way through to fabrication and installation. The relationship has built over the years, and become a strong and deep friendship. Lorenna speaks of the beauty and rareness of their professional relationship, due to the fact that they completely put their trust in each other and have learnt a lot together. “When working on such huge scales, I need someone that really knows what they are doing, and someone that prides themselves in their work. There is a lot of intuitive sense that comes from working with someone for 20 years, they can just about read my mind and they have got an uncanny knack to understand me. The installers too, they are working in 45-degree heat and yet they have great humour and nothing is too hard. Working with DENMAC, you’re flanked with people that have got your back.” Lorenna says. DENMAC works with the artist, designers and engineers to ensure that the initial design and detailing from the artist’s concept is able to be achieved without distorting the original design intent. From there the rest of the project, material procurement, fabrication, treatment, painting & final installation is completed. Depending on size, complexity or deadlines, the average timeframe of completion would be approximately 10 -12 weeks. Lorenna explains that the reason she stays with DENMAC is because they are always on the edge of what they are able to do, and when she approaches them with ideas there is an element of fear but always a willingness to say “yes” – which ensures they continue to have a great connection and professional relationship which wouldn’t have held up otherwise. While both Lorenna and DENMAC found it difficult to choose a project they have worked together on that’s a favourite, out of the 20 years there is one that stands out for both parties, which is The Arch. The Arch, corner of James Street & Lake Street was commissioned by the City of Perth to celebrate the opening of the Northbridge Piazza in 2009, and is still a talking point on how amazing it looks even after all these years. DENMAC had never done anything like it before, and Lorenna joined staff in the workshop day and night, laying out skin of the artwork right up until final installation. 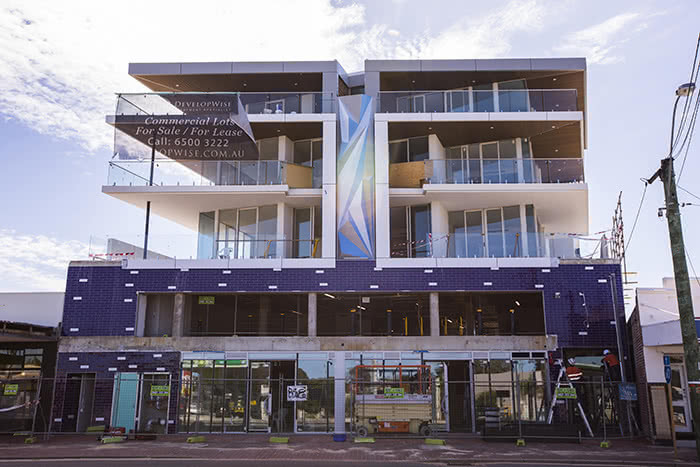 Made of steel and alpolic cladding, Lorenna describes this piece as a rhythm, a pulse, a beat reaching out, stepping out, a gritty take reflecting eclectic Northbridge. Lorenna has spoken out about how Northbridge is a favourite area of hers, and how she wanted to connect all the cafes, nightclubs and restaurants into the Northbridge Piazza. She was driven by community and wanting a piece that with “sharp edges” and being able to speak your mind in public. The idea stemmed from this jagged sketch at first, as Lorenna describes Northbridge as an unreal mix of every echelon of society and culture. She was keen to make the spot safer so her overhead intelligent design ensures drivers slow down and people become more aware in that area. When viewing this project, make sure you have a look at the last-minute addition of the ‘red heart’ which Lorenna describes makes the piece an angel. Speaking to the artist, it became clear that her favourite projects are the ones that are a bit more complicated and difficult. 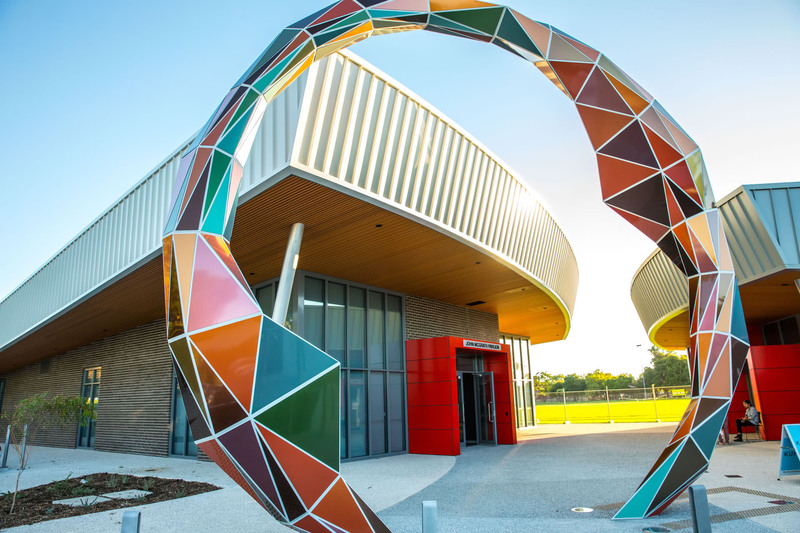 Other projects that stand out for Lorenna is the quirky, complicated and colourful Spring Development, and the “chameleon-like” project called “The Goal Keeper” at Ernest Johnson Reserve. This piece, made from steel, aluminium composite cladding and light, reflects on themes of intention and transformation with it changing colours in shifting light conditions. 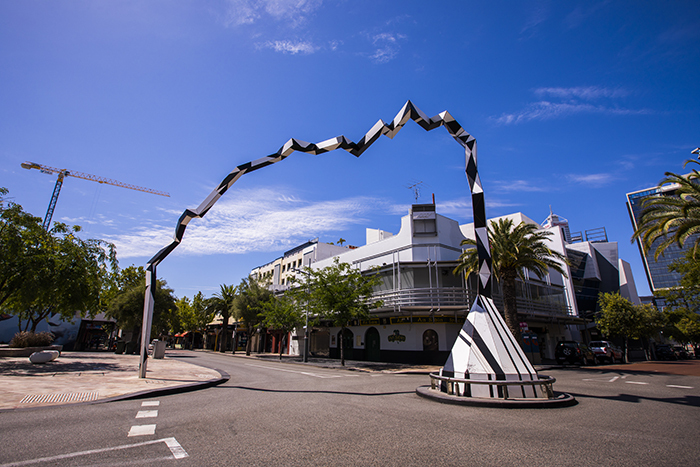 The Goal Keeper was commissioned by City of South Perth as part of its commitment to public art which celebrates and contributes to the City’s unique culture. Lorenna is an imaginative individual, passionate about the fact that we are all creatives that shouldn’t be living in boring and “beige” environments. Highly focused on what she wants to do, she is a big believer in whatever doesn’t come her way is not meant for her in the first place. She relishes the moment that everyone who has contributed to a project views the final product, and quotes David Bowie in the wonderful feeling of stepping out of your comfort zone.